In debates about covenant theology, it is imperative to be clear on federal headship. When inquiring, “is person X a member of covenant Y,” the answer will be determined by the question “what is the relation of person X to the federal head of covenant Y.” Determining how one is related to the federal head of a given covenant is limited and determined by that covenant itself. So, am I of Abraham’s covenant? Are you of Abraham? Am I of Christ’s covenant? Are you of Christ? Genesis 17:7-14 is clear on the former. Romans 8:9 is clear on the latter. The relation between the two is typological. They are related, but distinct. 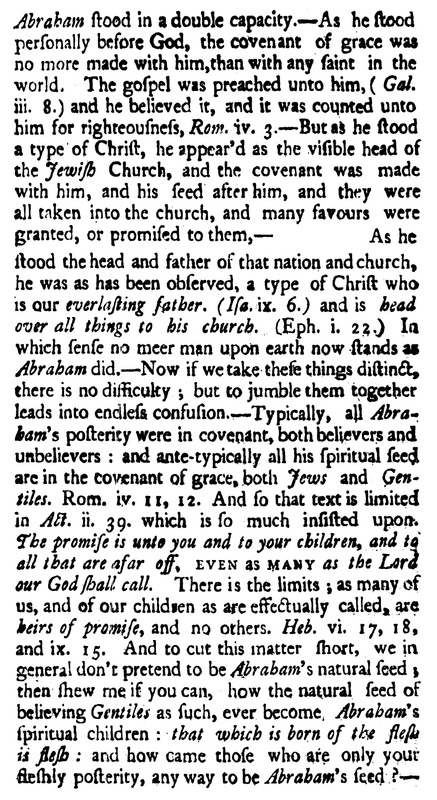 To take the nature and terms of Abraham’s federal headship and his covenant and apply them to Christ and his covenant is one of the the fundamental errors of Reformed paedobaptism. The other alternative (and the only “consistent” one within a Reformed paedobaptist paradigm), to which a former professor of mine acceded, is to say that because the Abrahamic covenant is the covenant of grace, Christ was the federal head of the Abrahamic covenant. The meaning of such an admission is that every single member of Abraham’s covenant from the greatest to the least, all, without distinction, could say: The second person of the trinity is my federal head in covenant with God. To explain this, I would like to know how this is exegetically justified, how this stands with the analogia fidei, and I would like to be shown where Reformed theology allows for a union with Christ beyond the confines of the elect that were promised to Christ in the covenant of redemption. The same question applies to a paedobaptist view of the covenant of grace as it stands today, namely, what is the nature of the union between the child of a believer and Christ, the federal head of the covenant of grace? Abraham stood in a double capacity. – As he stood personally before God, the covenant of grace was no more made with him, than with any saint in the world. The gospel was preached unto him, (Gal. iii. 8.) and he believed it, and it was counted unto him for righteousness, Rom. iv. 3.—But as he stood a type of Christ, he appear’d as the visible head of the Jewish Church, and the covenant was made with him, and his seed after him, and they were all taken into the church, and many favours were granted, or promised to them, — As he stood the head and father of that nation and church, he was as has been observed, a type of Christ who is our everlasting father. (Isa. Ix. 6.) and is head over all things to his church. (Eph. i. 22.) In which sense no meer man upon earth now stands as Abraham did.—Now if we take these things distinct, there is no difficulty; but to jumble them together leads into endless confusion. – Typically, all Abraham’s posterity were in covenant, both believers and unbelievers: and ante-typically all his spiritual seed are in the covenant of grace, both Jews and Gentiles. Rom. iv. 11, 12. And so that text is limited in Act. ii. 39. Which is so much insisted upon. The promise is unto you and to your children, and to all that are afar off, EVEN as MANY as the Lord our God shall call. There is the limits; as many of us, and of our children as are effectually called, are heirs of the promise, and no others. Heb. vi. 17, 18, and ix. 15. And to cut this matter short, we in general don’t pretend to be Abraham’s natural seed; then shew me if you can, how the natural seed of believing Gentiles as such, ever become Abraham’s spiritual children: that which is born of the flesh is flesh: and how came those who are only your fleshly posterity, any way to be Abraham’s seed? 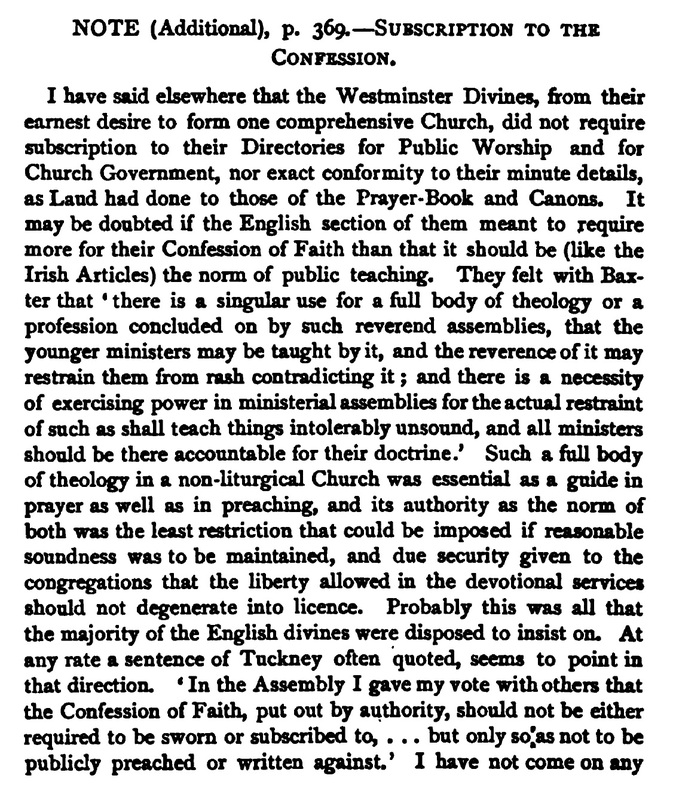 According to Mitchell, the Westminster Assembly intended their standards to be the public norm of teaching but not a matter of personal subscription. In other words, what mattered was that what was publicly taught was in accordance with the standards. This is not to say that the Westminster Divines would have been disinterested in personal conviction about the truth, or that a public norm of teaching and personal subscription are in any way opposed to one another, but rather simply that the confession was intended to be the public standard of orthodoxy in the national church. 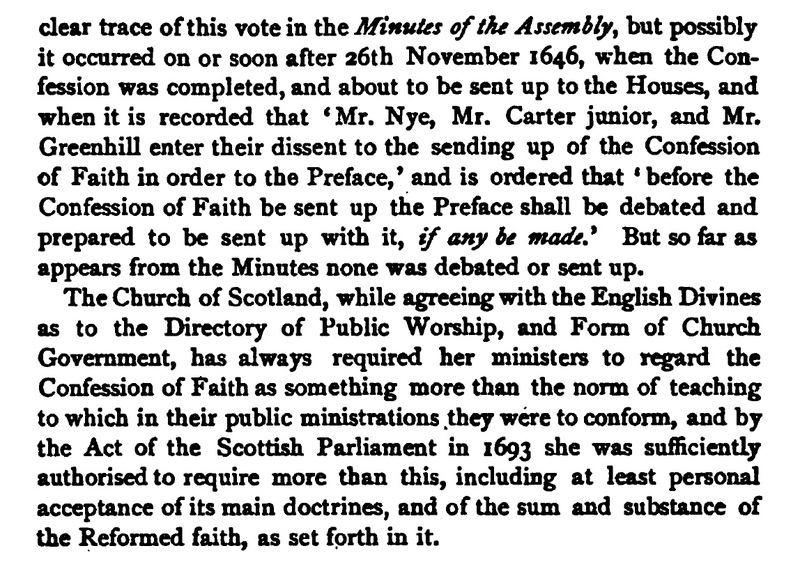 The Baptists did not treat their confession(s) in the same way, nor did the Scots, as Mitchell points out. But that is another story.